This shop was started by Mr Tan Boon Heong's father who was formally the assistant editor at the now-defunct newspaper, Nanyang Siang Pau. After that, old Mr Tan decided to venture in coffee business in the year 1959. Therefore, he named the shop after the newspaper, calling it Lam Yeo ("Nanyang" in Hokkien) Coffee Powder. In its early years, people on tricycles frequented their shop. According to Mr Tan, richshaws and carriages had vanished, thus reducing the number of customers. As Mr Tan's father got older, he passed his shop over to his eldest son, who had gotten into the business after leaving school at the age of 12. His eldest son, who had been selling coffee powder to hawkers, coffee-shop owners, tai-tais and amahs, is now the new owner of the shop. However, as the current owner ages to over 60, he is starting to make plans to pass on the family business to his sons, the third generation. Lam Yeo Coffee Powder sells old style coffee with a strong aroma for a living. It has been serving Singapore for over 50 years now, and has not changed much since it was first founded till now. The shopkeeper, Mr Tan Boon Heong, feels that there is no need for renovation as long as the place is kept clean and was intentionally so to preserve the tradition, making it very unique as hardly any shop still remains so old. There are about 20 to 50 customers every day, mostly the older generation, who were the shop’s customers since the early years the shop was built, and still love the taste of Mr Tan's coffee powder. Despite rising competition from nearby coffee outlets such as Starbucks plying ice-blended infusions and complicated Italian brews, Mr Tan is still able to retain regular customers. A good example would be Ms Lau, who has been a loyal customer for over 20 years, as she has found his coffee powder to be cheaper and more aromatic as compared to coffee sold in supermarkets. However, Mr Tan feels that they are lacking in one point, which is the element of convenience, as they do not have a carpark near their shop. This caused Mr Tan’s business to be "only passable", as he claims. 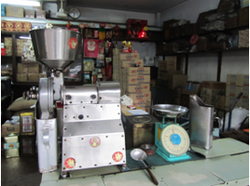 Lam Yeo Coffee Powder sells a wide variety of coffee beans. It is made from high grade coffee seed which is superior in quality and flavour. It has 10 signature blends of coffee that is harvested from various parts of Indonesia to Singapore's coffee-philes, where it is later roasted in a separate factory in Kallang. Mr Tan feels that it is this mixture of good beans and good roasting that results into the overall premium coffee powders. Also, there are two types of coffee powder which are the most selling in their shop, as Mr Tan claims. They are the Bali Coffee, which is sold at a price of $21 per kilogram and Arabica Mendheling, which can be purchased at $25 per kilogram. However, he also admits that he occasionally adds sugar into the mixture to give the coffee a deep dark colour that people like.